Last week I deployed a new Api hosted as an Azure WebApp, we wanted some reporting events to come out of it into our Splunk instance so we could keep an eye on whether it is working as expected. 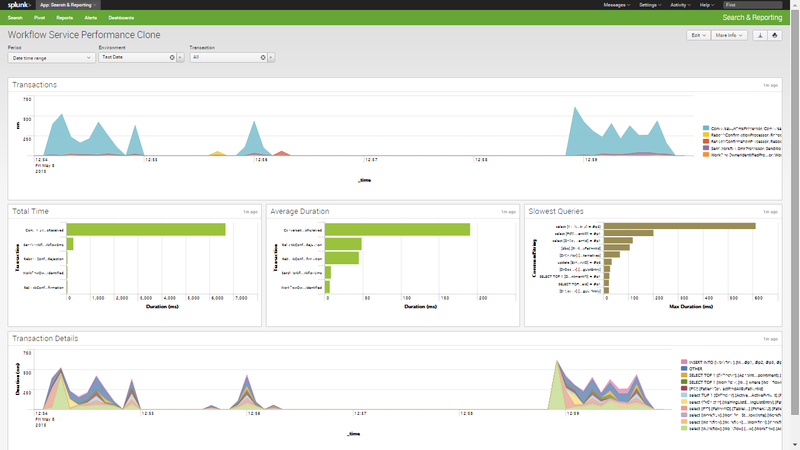 I started off by using the Splunk C# SDK as it looked nice and easy to add into our app. 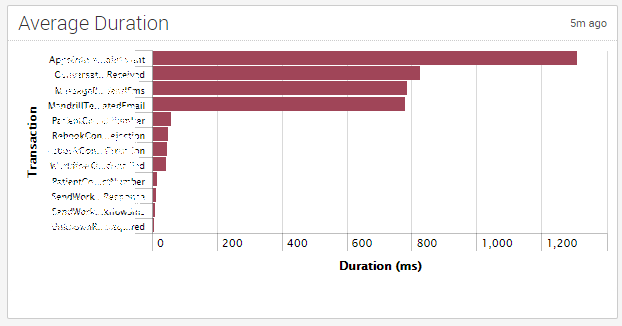 The Splunk SDK should have worked, but since there was A LOT of traffic at different times throughout the day the vast majority of the HTTP requests to the Splunk API just timed out. After I discovered that it constantly just timed out I started to look around for an alternative to using the Splunk REST Api endpoint. I’ve always noticed that Splunk lets you send events data to it via TCP/UDP but have never had cause or reason to use it. 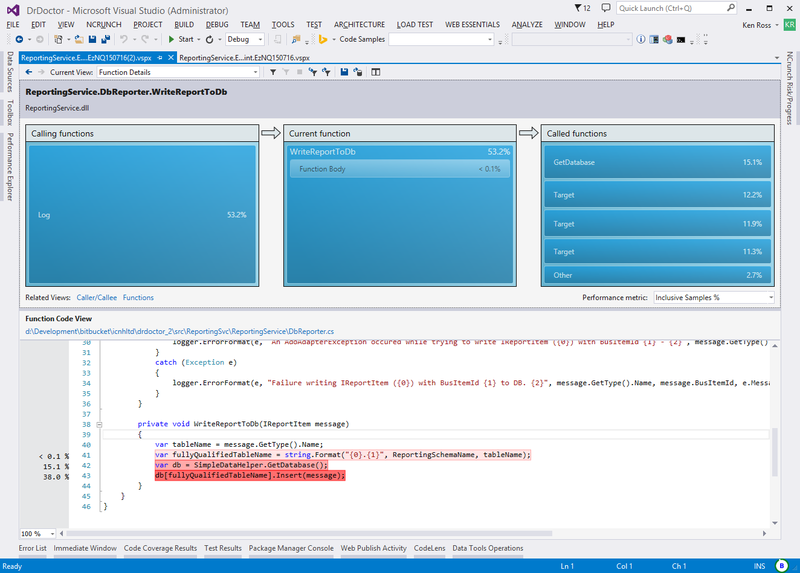 However given that our API was hosted as an Azure Web App and logging to the file system wasn’t an option I thought this would be the perfect time to try it out. As it turns out I was not disappointed. 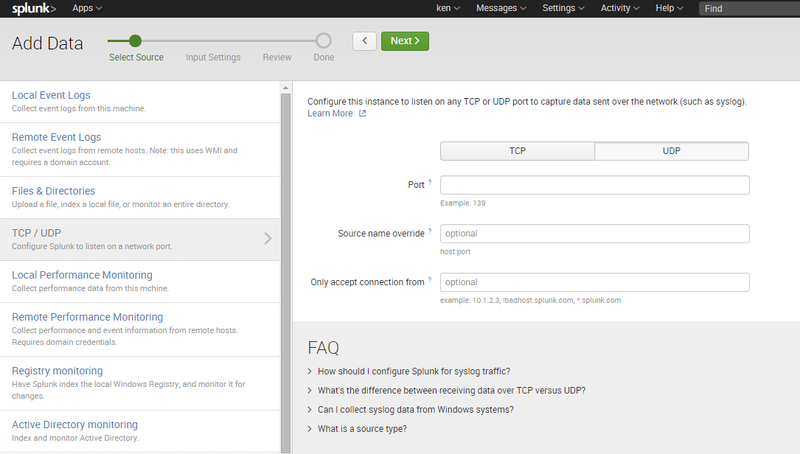 The first thing you will need to do is configure your Splunk instance to listen out for events from a Udp port. 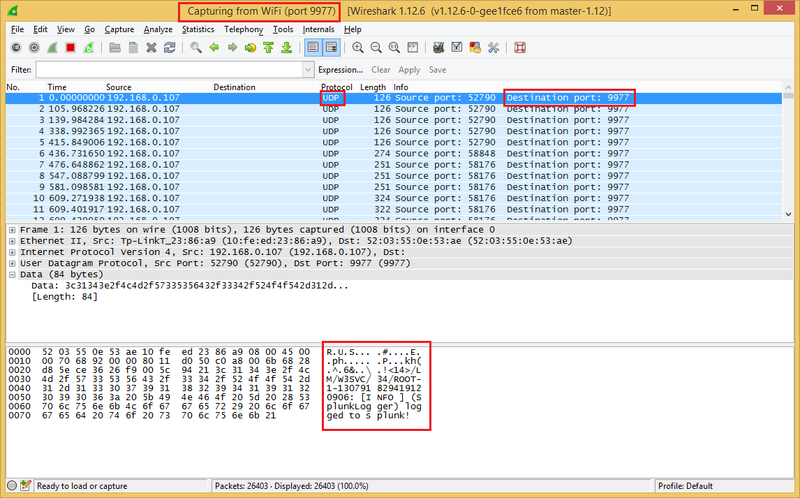 Splunk is now listening on that UDP port. Important Note: Make sure that all firewall ports between your producer and Splunk are open to allow UDP traffic on the specified port! Otherwise it will silently fail. And you should start seeing your events in Splunk. 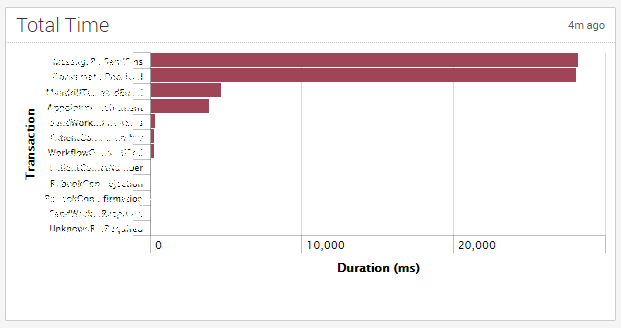 At DrDoctor we use New Relic for performance monitoring of our web applications. However web only makes up a small part of our overall system. We make extensive use of a messaging based system and have lots of micro-services which communicate over a messaging bus. After adding New Relic to our Windows services we soon realized that they don’t really do a good job of supporting them. The main reason for this afar as I can see from reading their docs is that New Relic depends on an active HttpContext for profiling applications. 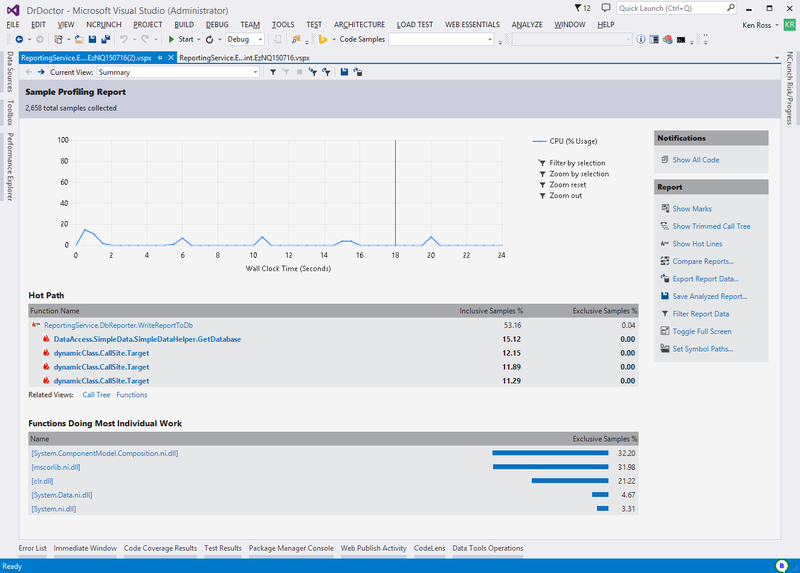 Having used New Relic to pinpoint the performance problems in our web app, I started to think about what it would take to build something similar but for a Windows Service. This blog post is showing off a proof-of-concept that I’m currently developing. This isn’t particularly pretty, and I’ll be the first to admit that using string.Format to create JSON is really bad practice, but I wanted something that would be lightweight and work with log4net, which is our current logging library. Really what I should do is adopt semantic logging and use something like Serilog. But I’ll save that for another day. With these two classes written plumbing it into my application became very easy and I soon had performance results being outputted as JSON into a log file, which I could then import into Splunk. With the plumbing done, its time to actually instrument our code. 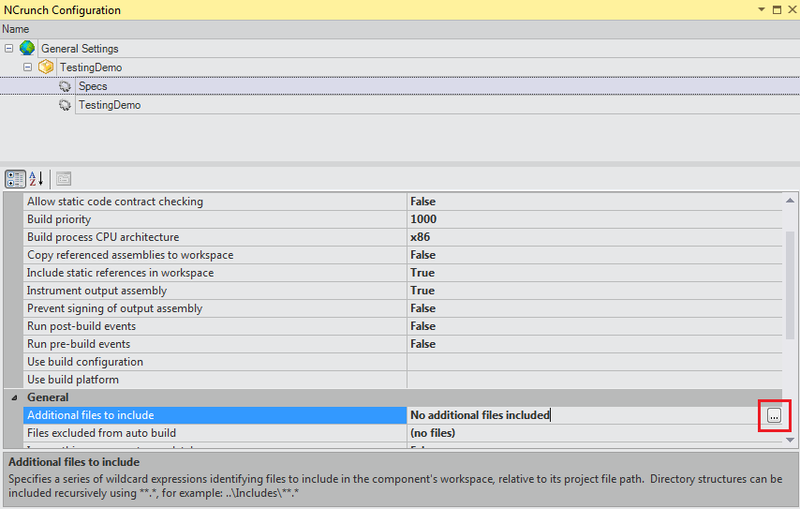 With Mini Profiler what you do is call MiniProfiler.Start() and then .Stop() at the beginning and end of a session. In addition to this, you can call .Step() anywhere in between and this create a kind of sub-profiler, if for example you wanted to explicitly measure the performance of a particular part of your code. When using Mini Profiler you will want to break your code into individual sessions, eg on a website this would be a single web request. With the idea being that you want to be able to measure and compare performance over time. As mentioned above, the services that I want to add this to all communicate over a messaging bus. 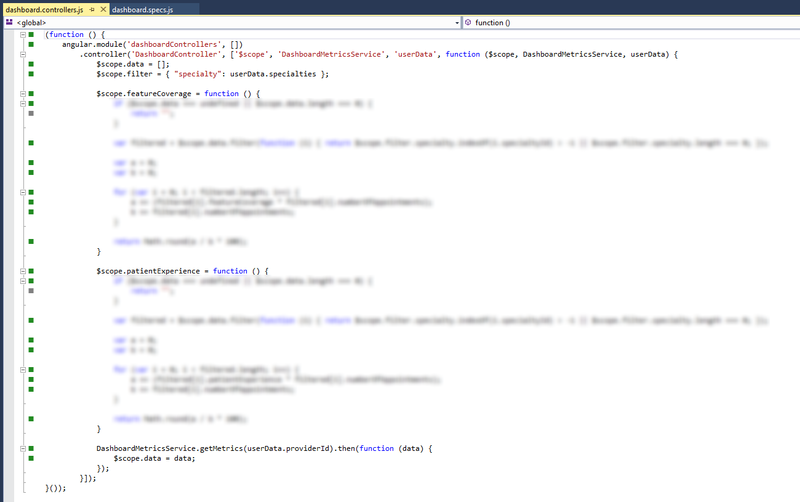 So the logical place to call .Start() and .Stop() is in the class that is invoked when a new message arrives on the bus. I also wrapped our database connection code with the Mini Profiler instrumentation code so that it can measure time spent executing SQL and what that SQL was. 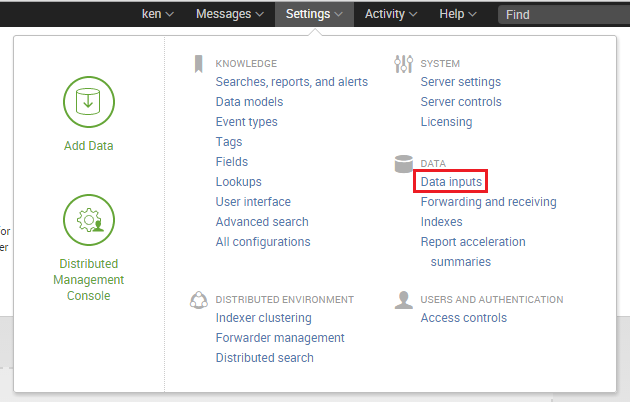 Since the data is being outputted as JSON it is really easy to import into Splunk, I’m not going to cover this here. With data in Splunk it’s time to turn the raw data into some useful charts. The first one is a stacked area chart, which shows the total time spent for a transaction over time. High values on this chart aren’t necessarily indicative of performance problems, as it could just be that we were experiencing high throughput of a certain transaction. A variation on the chart above would be to show the average duration instead of the total time, that would be more indicative of performance problems. The next chart shows the total time spent on processing for each different transaction in the selected time period. Once again this chart isn’t necessarily indicative of a performance problem. But does show where our system spends most of its time. The next chart shows the average duration of a transaction, this in the context of the previous chart could start to highlight potential problem areas. A variation on this chart would be to show it stacked with the number of times the transaction was executed. 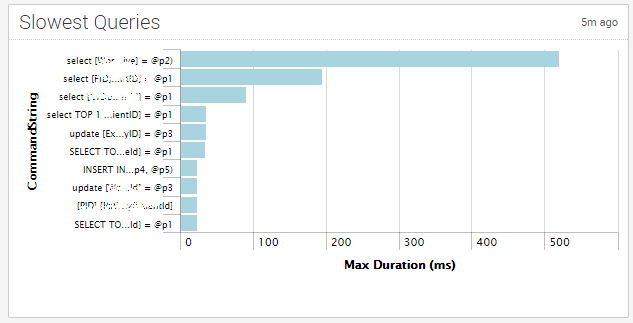 The next chart shows the maximum time it took to execute a SQL statement. This is very high level but still useful in seeing SQL queries that might need to be tuned. Averages would probably be a better values to show here. The last chart is a stacked area chart of time spent on the different actions that were measured, over time. This is more useful when looked at in the context of a single transaction type. 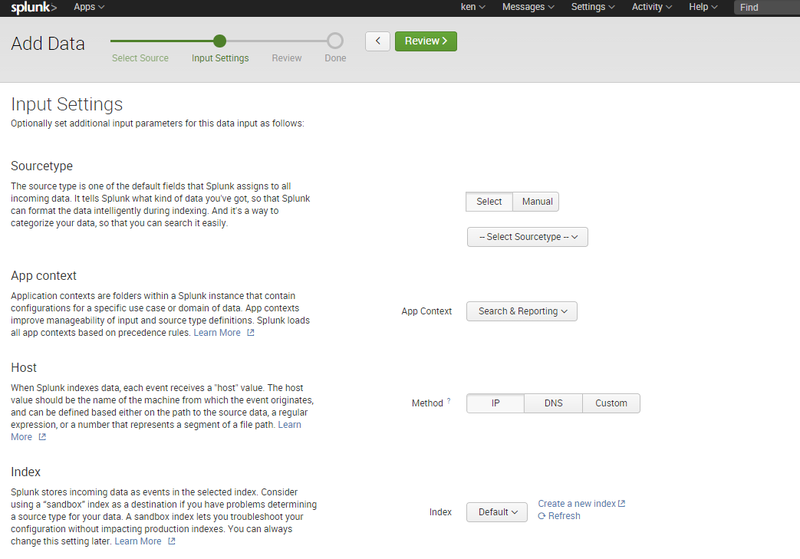 As an added bonus, Splunk lets you click on any of the charts and drill through to the raw events. This is still very much a proof-of-concept, I’m hoping to get this running in production in the next couple of weeks. When it’s running in production I’ll post a follow up. 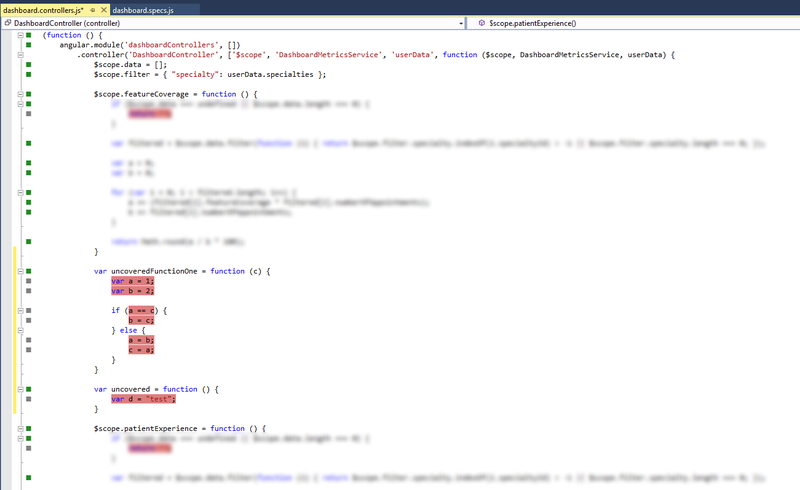 Recently, I’ve been replacing bit.ly with the Google URL shortener service for a .Net project. It’s a pretty simple service, and the documentation shows very clearly how to get going. The key thing that I want to draw your attention to is line 2, this implies (to me) that you are probably goign to keep the certificate in source control along with your code. This isn’t good, as it could lead quite easily to mistakenly making it public (e.g. pushing the project to GitHub). A better solution would be to attempt to load the certificate from the local certificate store on the machine. NB: Very important, you need to make sure you call the Open method on the store, otherwise you will find that calling the Find method will never return you a certificate. When importing the certificate into your certificate store, make sure you include the private key, otherwise your code won’t work. Recently I’ve been replacing the use of Bit.ly as a link shortener with Google’s link shortener service (goo.gl) in one of our .Net projects. I’ve recently started using Codealike, a service that tracks various metrics while I’m coding. The data it collects is then presented in a bunch of really useful ways to help determine when I’m being most productive, as well as the places our code base I spend most of my time and various other things. One of the metrics they calculate as part of this process is how “focused” you are and from this they determine whether or not someone should interrupt you – they have three different levels, No Activity, Can Interrupt and Cannot Interrupt. One of the worst things that can happen is being interrupted while you’re “in the zone” or as Codealike put it “on fire”. Codealike does provide a webpage that you could put on a display in your office which displays your current status (you can view my current status), however whilst I have two monitors at work I tend you use both of them. We use HipChat at work as our IM of choice, so, during the last week I’ve started to set my status as Do Not Disturb when Codealike thinks I’m in the zone. To remove the interruption of having to update my status in HipChat when I’m in the zone I set out to build the Codealike IM Updater. It’s a simple application that periodically checks my status according to Codealike and update my status on HipChat accordingly. 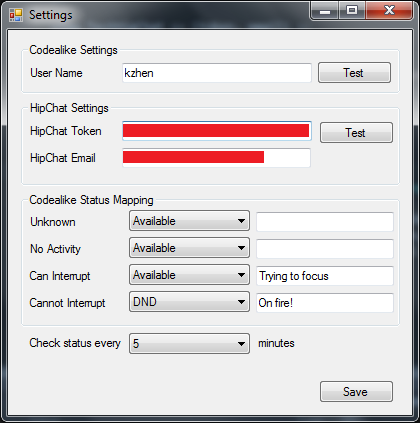 As you can see, it is very simple – all the user needs to do is supply their Codealike username, their HipChat API Token and Email address and how you want to map the different levels from Codealike to HipChat. Optionally you can also specify an optional message that is displayed next to your name in HipChat. The code is available on GitHub and if anyone would like to extend it to work with other IM services then I will happily accept pull requests. 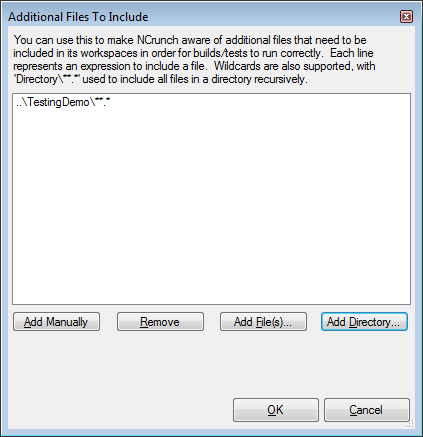 If you haven’t tried NCrunch before then stop reading this and go download the trial and try it out, it will forever change your testing habits* – for the better. The goal of the framework is to stay out of the way as much as possible and provide a super-duper-happy-path to all interactions. 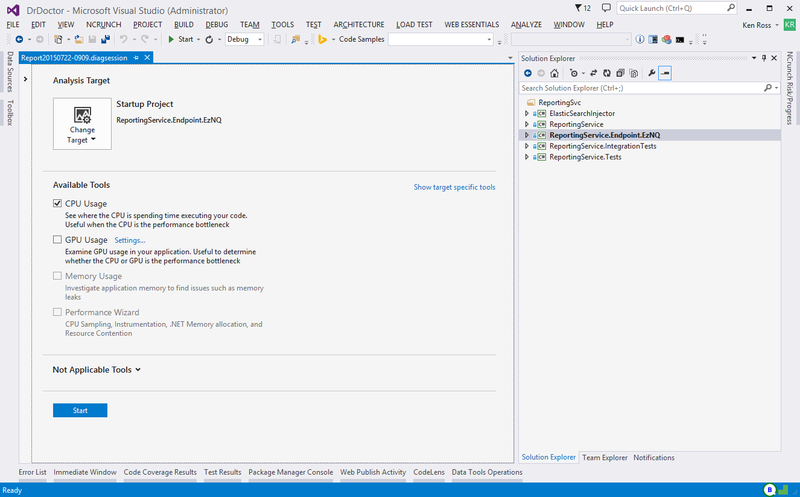 One of the greatest things about Nancy vs ASP.Net MVC is that everything can be tested, and we have tests for pretty much all of our Modules (read Controllers) as well as our Views. 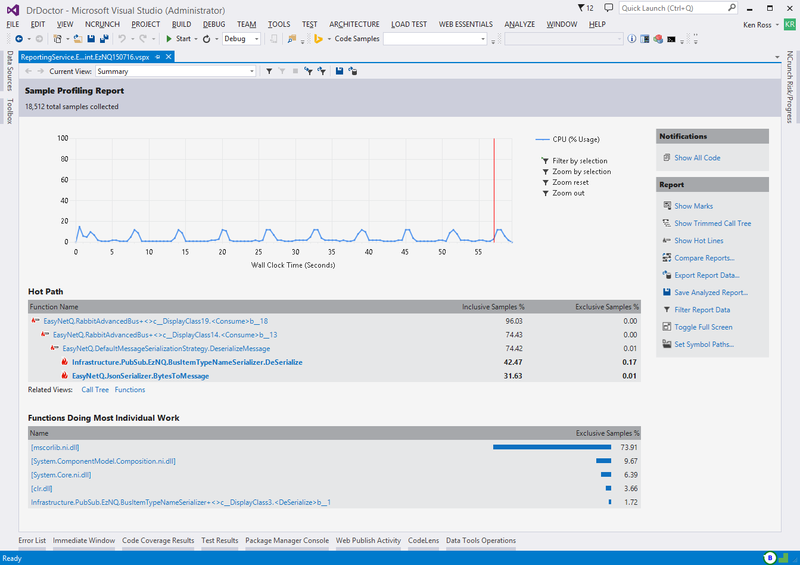 NCrunch does some serious magic when it comes to running your test intelligently in parallel. Up until a few days ago I couldn’t figure out how to get my tests to work. Testing Nancy Views is very easy, for demonstration purposes I created a new Nancy project from the standard ASP.Net and Razor Nancy template. 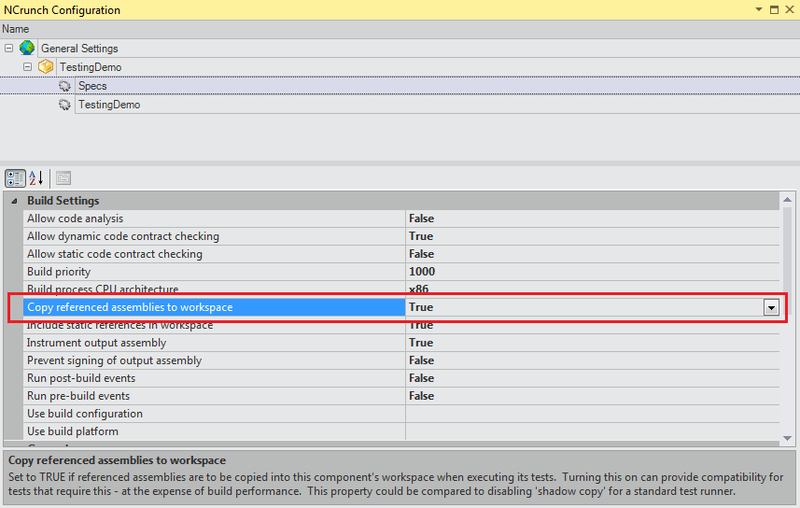 The template creates a module called IndexModule which returns a view called Index. 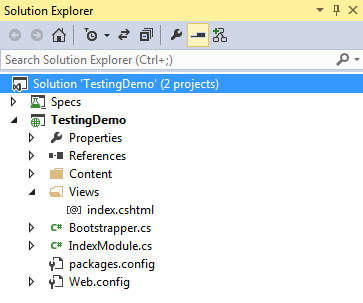 In the Specs project I reference the TestingDemo project and then added the Nancy.Testing and Nancy Razor View Engine (since I’m testing Razor views) NuGet packages. 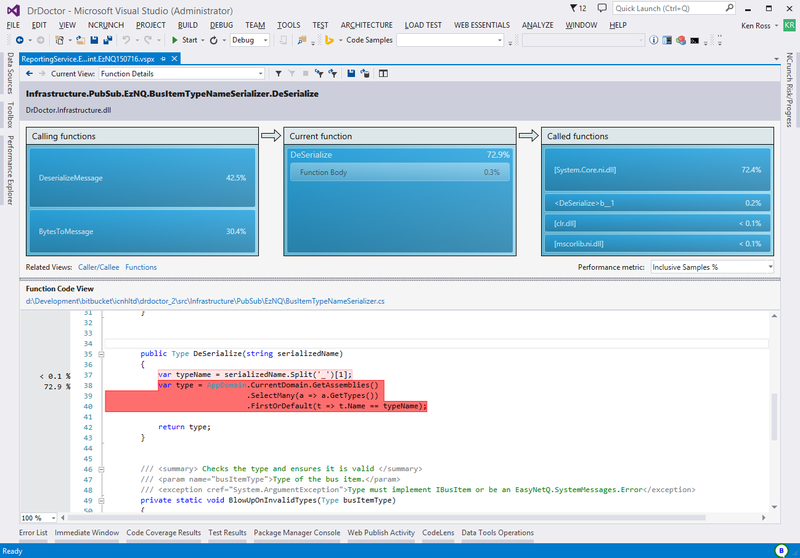 At this point the test passes in the visual studio test runner, but fails in NCrunch. To get the tests to pass in NCrunch you will need to make a few changes to the NCrunch configuration for the test project. * May not actually change your testing habits.